An infantry company goes to Vietnam. "Great reportage," The New York Times. "Great literature," The Dallas Morning News. "A superb book," The Nation. "One must go back to Orwell for appropriate comparisons," The Washington Post. "Funny, lunatic, savage, compassionate, moral, real, important," The Christian Science Monitor. 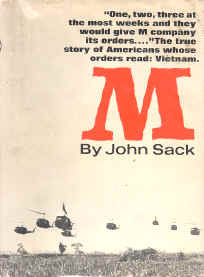 "Absolutely the best book to come out of Vietnam,"
"Sack achieves for the Vietnam experience the quality of William March’s Company K in World War I, of James Jones’ From Here to Eternity in World War II," The Los Angeles Times. M has just been nominated by the NYU Department of Journalism as one of the top journalistic works of the twentieth century.